Over the weekend we went on a road trip to Northern California. A great time was had by all, but especially the boys because they got to swim in the hotel pool. While splashing about, Benjamin smacked his mouth on the metal handrail. I heard it, then I saw his hand go to his mouth and come away with a small white pearly tooth. He shook the tooth off his hand, into the water, while his mouth filled with blood. I left Ben to Daddy and took off after that tooth. It was a front, top, baby tooth, and unfortunately, it was the absolutely least wiggly one of all. Oh well. 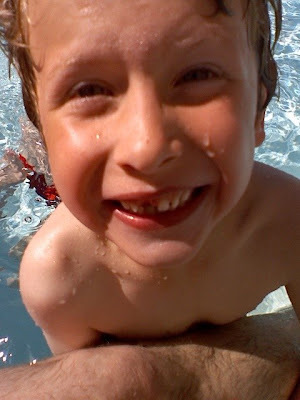 When Nathan lost his two top front teeth, the enormous grown up permanent teeth were fully in place within 7 days. I have exactly two photos of him without his front teeth! I don't think we'll be seeing Ben's grown up tooth there any time soon, there's nothing but gum!